Vegan Month of Food 2013 – Allez cuisine végétalienne! 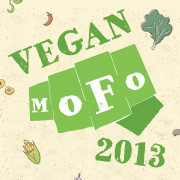 “VeganMoFo was originally created on the Post Punk Kitchen, as an homage to NaNoWriMo. Because we do want to write novels, but sometimes cooking gets in the way. So why not combine them! So, as you’ve read, the VeganMOFO is an international bloggers event, all about delicious vegan food. And since we like a little challenge (as if being vegan in a non-vegan world wasn’t…), we decided to dedicate our VeganMOFO-posts to the French cuisine. I think, by now you get that there are a lot of aspects of the French culture that we like. But since we are not even vegetarians anymore, and food is an important part of French culture, we unfortunately often seem to miss out on this one. We’ll be happy to take you with us on our vegan journey through the French cuisine! This entry was posted in Vegan MOFO and tagged French, Vegan, Vegan MOFO 2013. Bookmark the permalink.